There is something about the air turning a bit more crisp and the smell of fall in the air that makes me crave pumpkin. These cookies are the perfect compliment to the season. 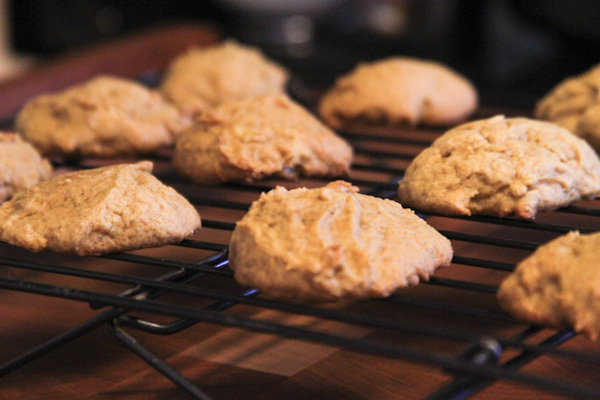 It’s mild pumpkin flavor makes these pumpkin cookies a safe bet for everyone. Visiting the farmers market I can’t resist purchasing pie pumpkins. They sit on the tables taunting me to buy them. They are usually only a dollar or two which makes for very inexpensive pie puree for baking. For years I never knew how to bake up my own pumpkin to make my own pumpkin for pies and cookies. Little did I know at the time how easy it is. It’s pretty much how you cook any squash and it makes the house smell like fall while you bake. 1. CAREFULLY cut pie pumpkin in half. Scoop out all the seeds. 2. 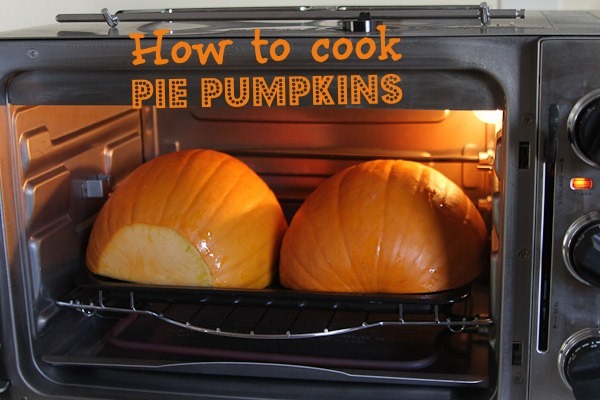 Place pumpkins cut side down and bake at 400 degrees for at least 30 minutes or until completely soft. 3. Remove from oven and cool completely. Scoop pumpkin out of shell and mix until smooth. 4. If the pumpkin appears to be really wet you can place it in a cheesecloth and hang above a bowl or the sink for an hour or two and let the moisture drain out. 5. Use in equal amounts in place of canned pumpkin. 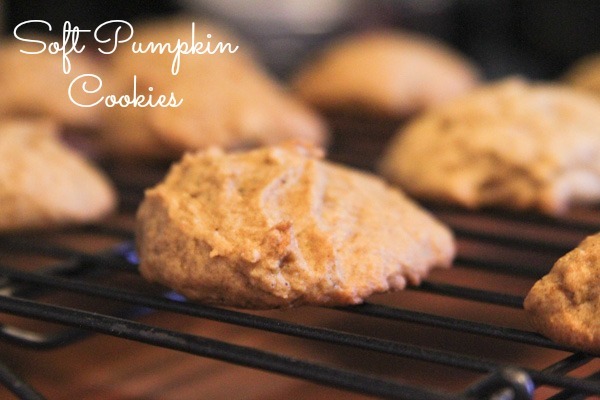 I used a counter top convection oven to bake these pumpkins. They fit perfectly inside. The directions above are for a standard oven. Mix together flour, baking soda, baking powder, pumpkin pie spice and salt. Cream together sugar and butter in a separate bowl until well blended. Whisk in the pumpkin, egg and vanilla extract until smooth. Gradually add flour mixture into wet ingredients, mix until just combined. Drop by rounded tablespoon onto prepared baking sheets. Bake for 15 to 18 minutes or until edges are firm. Cool on wire racks. I will definitely be making these for the holidays. yum!